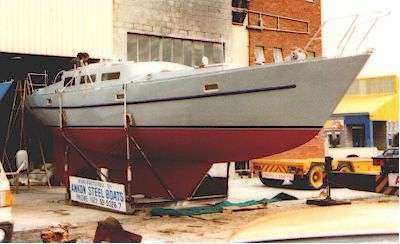 The ANKON 38 was commissioned by the Cape Town based steel boat building yard of Ankon cc. Originally conceived as a larger sister to my Pratique 35 design, she was changed at an early stage in the design process to a round bilge design. 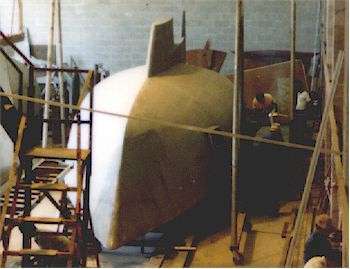 Before completion of the first boat, the hull was lengthened to 40ft by extending the stern and changing it to a swim platform detail. She is longitudinally framed over widely spaced transverse framing to more easily produce a fair hull. The transverse frames are generally placed at bulkhead positions and are kept clear of the hull skin for ease of maintenance and to minimise welding distortion. The deck and cabin top can be either plywood or steel, both with steel cockpit. The underwater profile of the boat is similar to that of the Pratique 35 but with a more vertical leading edge to the keel to help her to weather. The keel comprises a long, shallow keel which contains the tankage and below which is a low aspect fin keel which contains the lead ballast. Also below the long keel is a skeg forward of the rudder. The cutter rig is tall and highly efficient but breaks the sail plan into easily handled areas for a cruising couple or single handing. The mast has double spreaders and standing intermediate backstays to support the inner forestay. The interior is laid out to comfortably accommodate six in three private sleeping cabins, leaving the central saloon, galley and head areas free for communal use. The forward and aft cabins are each fitted with double berths and the port cabin has upper and lower single berths. A sail locker in the bows moves the forward cabin out of the most uncomfortable and confined part of the hull, making it more spacious and usable. The two forward sleeping cabins and the head compartment are below the low trunk cabin and are one step down from the rest of the accommodation which is below the raised section of the trunk cabin. The six-seater dinette is opposite the galley and separated from it by a walkway, keeping the cook out of the traffic lane. Aft of the galley is the navigation station with stowage behind it under the cockpit. As an option, a single quarter berth can be fitted aft of the nav table with the head of the berth forming the navigator's seat. The engine is in a box under the main companionway and has free access to three sides and restricted access through the bulkhead on the fourth side. The Ankon 38 is a clean and roomy boat suitable for long distance cruising short handed or with a crew. Her underwater profile makes her directionally stable for self-steering yet manoeuverable and she has the capability of standing on her keel to lean against a dock without falling on her nose. Her moderately heavy displacement makes her comfortable at sea while her freeboard keeps her dry on deck. The Ankon 40 has the same hull extended by the addition of planing boards and a swim platform to ease boarding from the water or a dinghy. The rudder becomes an inboard rudder with shaft and stuffing box but remains supported by the skeg. The layout shown for the ANKON 40 shows the navigation table replaced by a second head compartment for use in bareboat charter fleets. The variations between the two boats are fully interchangeable to allow owners to customise their boats to best suit their individual requirements. Follow these links to print or download a material list for the structure, the stability graph or the list of drawings for this design. Please note that our plan prices include for adding imperial measurements to our metric designs if needed by the buyer. Click here to contact us by whatever method suits you.